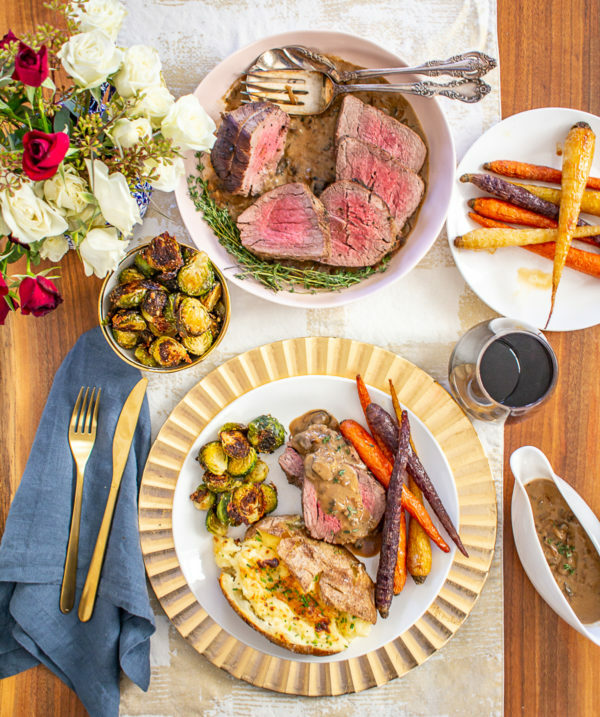 Wondering what to cook for Valentines Day? 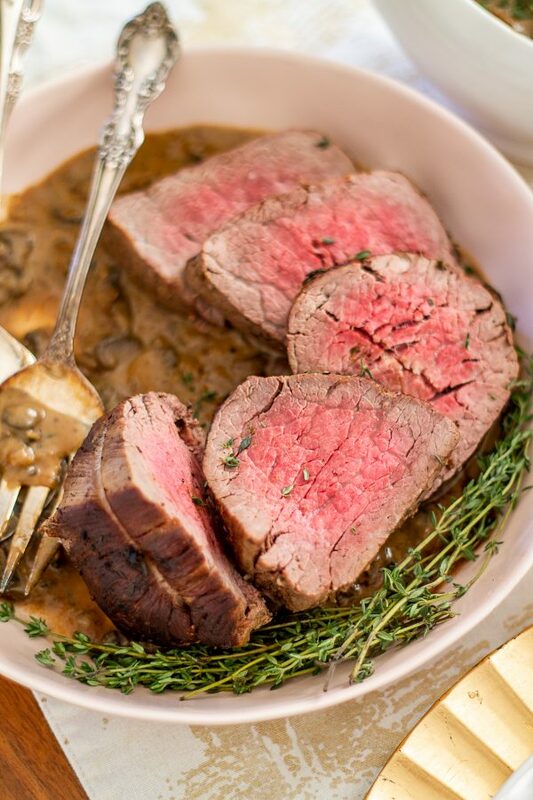 You can’t go wrong with a classic Beef Tenderloin with a Sherry Mushroom Gravy! 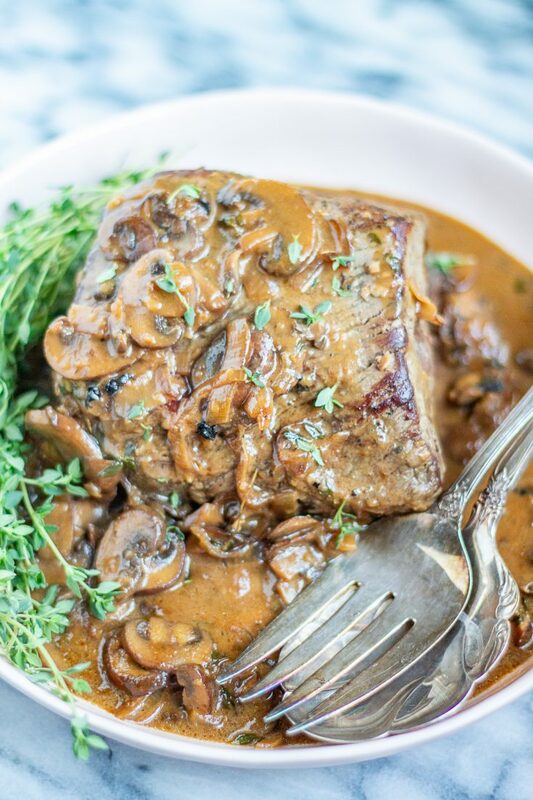 This beef tenderloin has a rich and delicious mushroom sherry gravy with just a touch of cream. 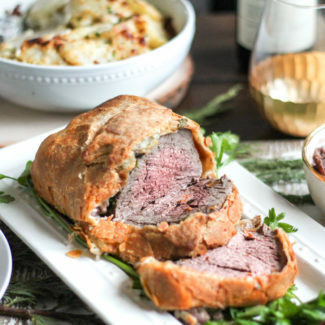 Don’t be intimidated by cooking beef tenderloin, it’s easier than you think, and if you use a meat thermometer as a guide you can’t go wrong. 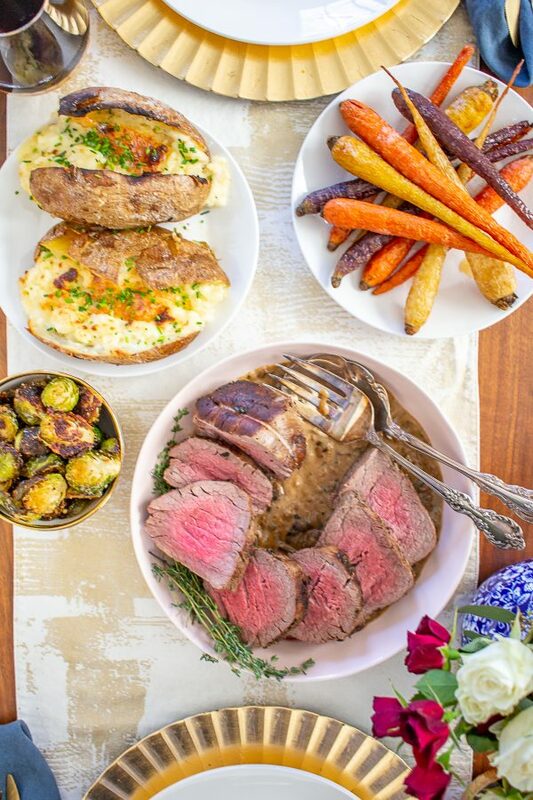 Beef tenderloin with twice baked potatoes is a meal that your Valentines date will be sure to love. And a quiet and romantic date night at home is much better (and more affordable!) than a loud and crowded restaurant. 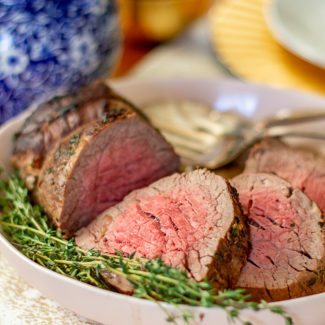 If you are unfamiliar with beef tenderloin, it is the same section of meat as filet mignon. 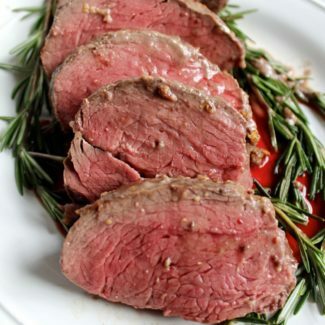 It’s called beef tenderloin when it is a bigger roast, and filet mignon when it is sliced into steaks. It is the most tender cut of beef. 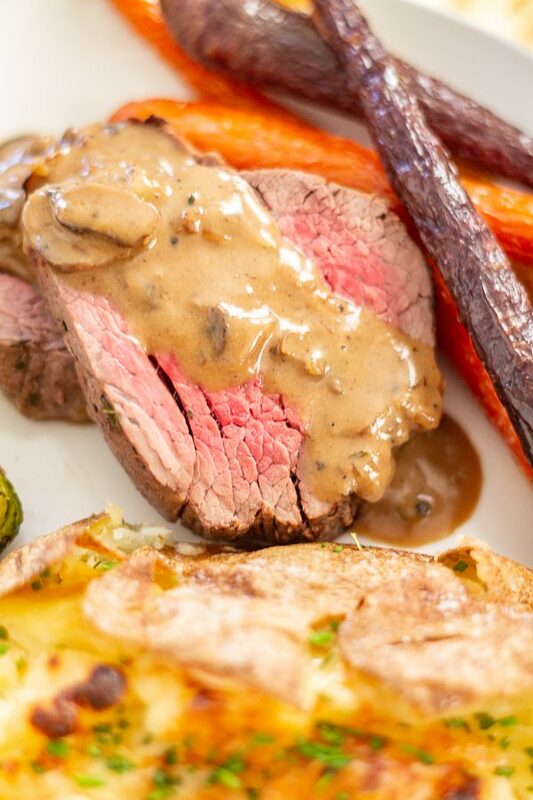 I like to cook beef tenderloin instead of filet mignon because it is a little easier, and since there are more pan drippings you have the opportunity to make a great gravy. 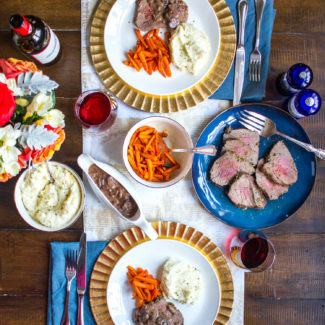 You will want to buy beef tenderloin at the meat counter at your grocery store. Usually my butcher cuts it for me right then and there. For two people, I recommend getting 1 ½ pounds. This is plenty for dinner and some leftovers. You want to make sure you have at least ½ pound per person. The photos in this post show a 1 ¾ pound beef tenderloin which is enough for 3-4 servings. There is one very important rule for cooking beef tenderloin: it keeps cooking after you take it out of the oven. It will increase in temperature 10 more degrees while it rests. 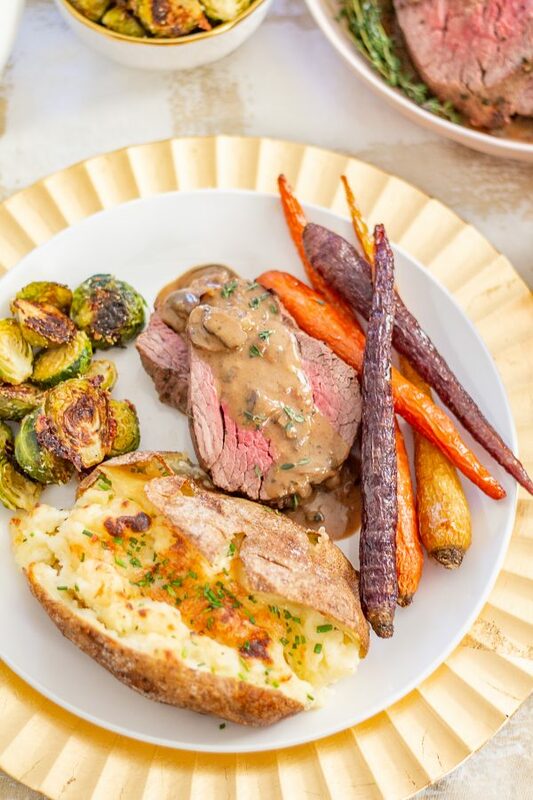 I think you should serve this beef tenderloin with twice baked potatoes. 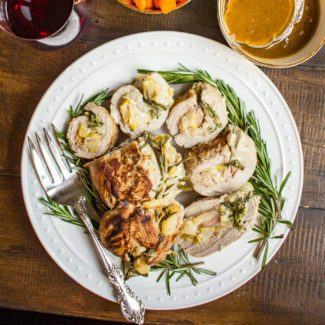 The gravy is magnificent over potatoes and it makes a perfect meal. 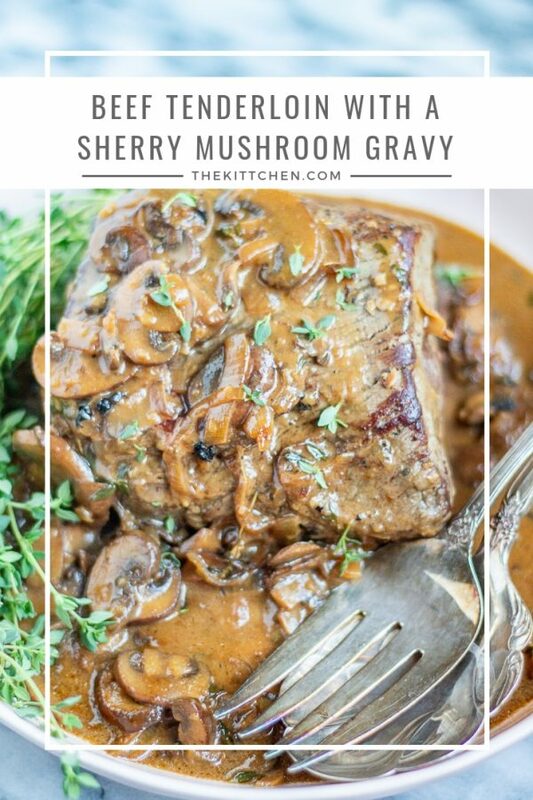 Beef Tenderloin with a Sherry Mushroom Gravy | This 45-minute beef tenderloin recipe has a rich and delicious mushroom sherry gravy with just a touch of cream. Heat your oven to 375 degrees. Then get to work sautéing the mushroom and shallots. Melt 1 tablespoon of butter in a dutch oven over medium heat. Once melted and bubbling, add the mushrooms and stir to evenly coat them in butter. Season with ½ teaspoon of salt and ¼ teaspoon of black pepper. Let the mushrooms cook for 4 minutes, stirring occasionally, and then stir in the shallots and ¼ cup sherry. Let cook for another 4 minutes, until the mushrooms are slightly browned and the liquid has been absorbed. Remove from the dutch oven and set aside. You will use the same dutch oven to prepare the beef, you may want to wipe it down. In a small bowl, combine the remaining butter, salt, and pepper with the garlic and thyme. Use a couple paper towels to pat the beef dry, this helps the butter rub stick to the meat. Evenly spread the butter rub all over the meat. Heat the dutch oven over high heat, letting it get hot before you add the beef tenderloin. Cook each side of the beef, including the ends, for about 2 minutes, until browned. Keep on eye on things and if the pan drippings look like they may burn, add some beef broth to the bottom of the pan. Once the beef has been browned, return the sautéed mushrooms and shallots to the dutch oven. Pour 1 ½ cups of beef broth into the pan. 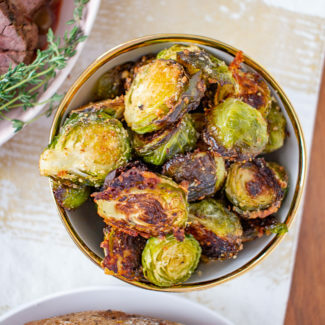 Insert your digital in-oven thermometers into the meat, put the lid on the dutch oven, and place the beef tenderloin into the oven to roast for about 30 minutes. 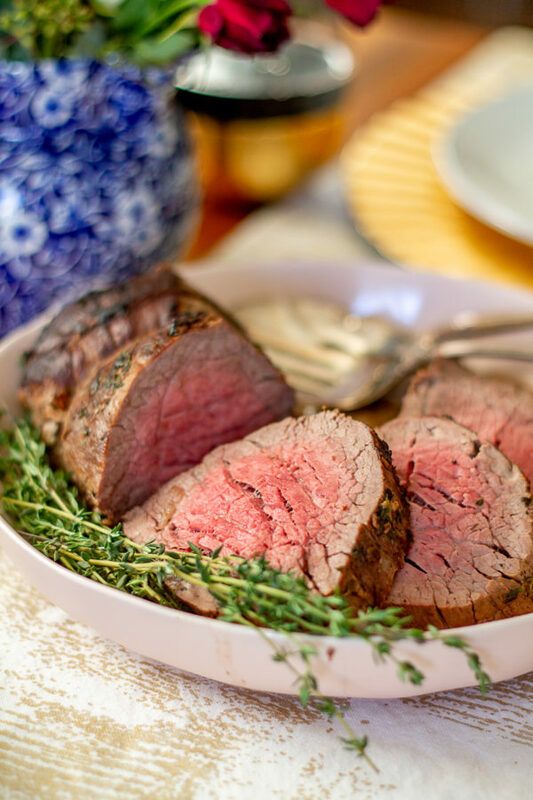 Keep a close eye on the internal temperature of the beef tenderloin, if you want rare beef remove the tenderloin from the oven as soon as it reaches 110 degrees. For medium rare, remove it at 120 degrees, and for medium remove it at 130 degrees. I recommend cooking beef tenderloin until it is medium rare. And note that the end slices will be more cooked than the slices in the middle. As soon as you remove the meat from the oven. Take it out of the dutch oven and wrap it with aluminum foil, and let it rest for 10 minutes. Now turn your attention to the drippings in the dutch oven, let’s turn that into gravy. Heat the pan drippings over medium heat. Whisk the flour and cream together, and then stir them into the pan drippings along with the remaining sherry, and bring to a steady simmer. Let the gravy reduce and thicken for 3-4 minutes. Taste and add more salt and pepper if necessary. Unwrap the beef tenderloin (if any juices are in the foil, pour them into the gravy). 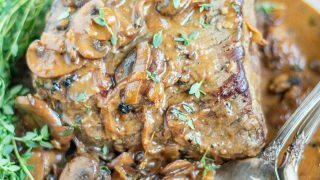 Slice the beef into thick slices, and serve the beef with the mushroom gravy. Garnish with any leftover thyme.